As the British markets were closed during the Christmas holiday on Tuesday, USD strengthened against GBP. 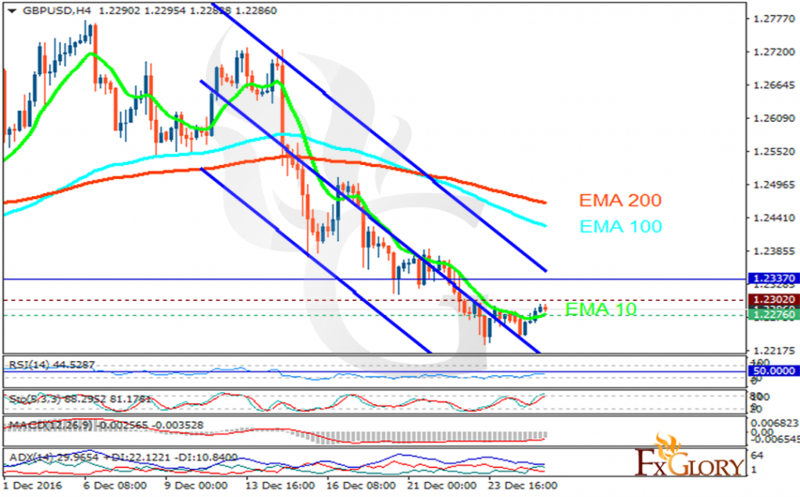 The support rests at 1.22760 with resistance at 1.23020 which both lines are below the weekly pivot point at 1.23370. The EMA of 10 is moving horizontally but it is below the EMA of 100 and the EMA of 200. The RSI is moving below the 50 level, the Stochastic is showing upward momentum and the MACD indicator is in negative territory. The ADX is showing a weak buy signal. Short positions are recommended targeting 1.2100.